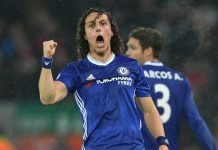 A four-point lead with five matches to play is the situation Chelsea find themselves in on Sunday afternoon as they travel north to face an in-form Everton team at Goodison Park. 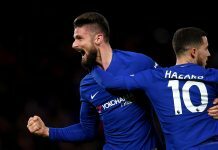 That lead at the top of the Premier League was briefly stretched to seven points after Chelsea overcame a few nervy first-half jitters to defeat Southampton 4-2 on Tuesday night. The Blues’ title rivals, Tottenham, did their part to reduce that gap back to four after defeating Crystal Palace 1-0 at Selhurst Park the following evening, but Spurs will once again play after the league leaders – this time facing Arsenal in at White Hart Lane. From Chelsea’s perspective, it’s simple. A win at Goodison on Sunday puts them at minimum four points clear with just four matches to play, and that should put the Blues comfortably in touching distance of the title, with three of those remaining matches being played at Stamford Bridge. But going to Goodison Park is never an easy trip for the Londoners. Chelsea have lost six times in their last 10 trips to face Everton, and the Toffees are on a run of eight consecutive victories. For Everton, they sit comfortably in seventh place at the moment, but a win over Chelsea could put them within touching distance of the top four, provided other results fall their way during this matchweek. It’s not too much of a stretch to think that it’s possible for Everton to get something against the league leaders. The Toffees will trot out the Premier League’s top scorer this season in Romelu Lukaku with 24 goals and might just have a point to prove against the Blues, not least because he’s been linked with a move back to Stamford Bridge in the summer. But Everton’s big concern isn’t in attack. It’s in defence. The last international break wasn’t kind to the Merseysiders, losing both Seamus Coleman and Ramiro Funes Mori to season-ending injuries. The loss of Coleman has probably hurt Everton the most. Mason Holgate has shown promise filling in for the Irish fullback, but he lacks the consistency of Coleman and is still learning to play at the top level. The injury to Funes Mori also likely means that Ronald Koeman will be unable to line up in a matching back 3 against this Chelsea side, although that might be a blessing in disguise after they tried at Stamford Bridge back in November and were thumped 5-0. Antonio Conte’s Chelsea side have far fewer problems. The injury gods have been kind to Chelsea this season, with Conte once again having a full squad to choose from for this match. Even better for Conte, his man leading the line, Diego Costa, has finally seen a ball hit the back of the net that was credited to him, scoring two goals against Southampton. A return of the confidence that Costa exuded in the early part of the season would be a welcome sight, especially as Eden Hazard has ratcheted up his play, aside from his display against United just a fortnight ago. Hazard’s goal against Southampton marked his 15th goal this season in the Premier League, his highest total since joining Chelsea in 2012 and his highest total since the 20 he scored in his final season at Lille. If Costa and Hazard play with confidence against Everton, the Toffees could be in real trouble, especially with a slightly shaky back line. If nothing else, Conte will demand focus from them since Spurs will know the result as they trot out for the final North London Derby at the current White Hart Lane. Spurs let the pressure get to them down the stretch last season, and it’s up to Chelsea to keep that pressure on their nearest challengers. A win on Sunday, and Chelsea’s march to the title suddenly becomes a lot easier.